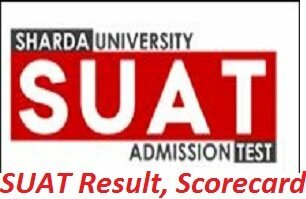 SUAT Result 2019: The candidates who have appeared in the SUAT B.Tech admission test 2019 are informed that the Sharda University has all prepared itself to release the SUAT Result 2019. So, all the candidates are advised to stay updated with us, we will make you available with the direct link from where you will be able to check your SUAT Scorecard 2019 online We are predicting that the SUAT will release the Sharda University B.Tech Admission Test Result 2019 in July 2019. On the basis of the marks obtained in the Sharda University AdmissionTest, the candidates will be allotted the seats in the Sharda University Classroom Engineering Courses. You can check here the SUAT Cutoff 2019 for knowing your performance in the exam. The candidates who clear the SUAT Merit List will be called for the SUAT Counselling/ Seat Allotment Process. The candidates are advised to either follow the below given steps or they may follow the direct link given below for checking their SUAT Result 2019. Generally, the Sharda University releases the B.Tech admission Test result within one month after the exam conduction. Since the exam will be conducted on 01st June 2019 so we are predicting that the Sharda University will release the SUAT Result 2019 by the last week of July 2019. Visit Sharda University official website, i.e. suat.sharda.ac.in/. Go to SUAT result link in the notification section and click on it. Enter application id and password and click on the submit button. The SUAT Result will appear on your computer screen. Download scorecard and take a print copy. The selected candidates those who clear the SUAT cutoff marks 2019, they will be able to apply for the Seat Matrix of SUAT 2019. By the seat Allotment, the exam community will decide the seats that are to be allotted to the students as per their performance and the marks scored in the examination.. The counselling Process of SUAT 2019 will be complete in 3 rounds that are given below. Students need to apply for the counselling form of the exam and also have to upload the score card of the SUAT. By this process, the examination authority will decide the seats that will be allotted to the candidates. The seats will be allotted to the students according to their performance in the exam. After counselling 1st round students can check their seats with the institute name. In this round, the examination authority will rearrange the allotted seats and the remaining seats will be allotted to the candidates to whom the seats will not be allotted in the first round. Interested candidates need to apply online for this process. And after seat allotment, the students can check the rearranged seat allotment list online from the official website. This is the 03rd and final round in which the remaining candidates will be allotted the seats on the vacant places that are available in the colleges as per the choices filled in the college option form. Students need to visit the university with all original documents at the university for complete the admission formalities. You also need to pay the fee at the university for admission. The Students can check the cutoff marks of SUAT 2019 on the official site of Sharda University after the declaration of SUAT Result 2019 which is expected to be released by the last week of July 2019. By checking the SUAT Cutoff 2019, the candidates will be able to guess the college that is going to be allotted to them. The cutoff on SUAT 2019 will depend on the number of students that appear in the exam. For any type of assistance, while checking the SUAT Result 2019, you are advised to contact us by commenting at the end of the post.